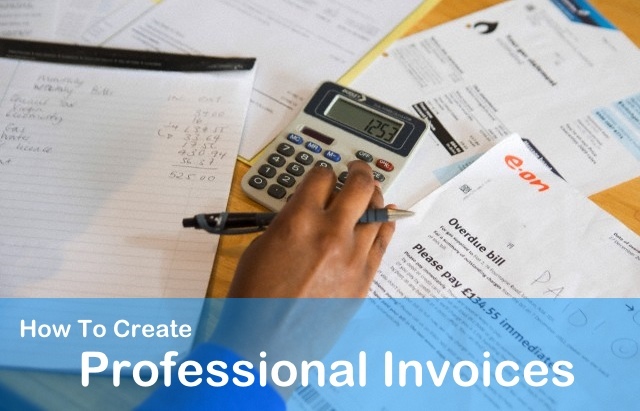 Creating a professional invoice might seem like an easy thing to do but its often the toughest task, specially if you are doing it for the first time. Its often the last communication with the client and hence, must leave a good impression about your company. Lets find out how you can create a good looking professional invoice, best practices and some follow up techniques. – Can I provide an option to return goods or services? If yes, what will be my return policy? – What are my payment terms? How much credit I can offer? – Should I charge a late payment fee? If yes, how much? – Should I ask for an advance payment? If yes, how much? You don’t have to spend a lot of time on it or get any legal help. Its more like the terms that you want your client to agree so that you can avoid any disputes later. Ask yourself how are you going to collect the payment once an invoice is sent to the client. If its by cash or cheque, how its going to be sent to you? If you want your client to pay you using credit card, signup for an online payment gateway. For international clients, Paypal is good place to start with. Indian companies can signup with Citrus or CCAvenue to setup a gateway. Most of the good payment gateways companies in India have now stopped charging for the setup and annual fees. Also check if there are any expenses that might be incurred at your end during payment collection process. It will be a good idea to include this cost in the invoice. Check how you can integrate a payment link on your invoices so that your customers can pay you easily . A good looking invoice can reinforce trust in your client’s mind. So, make sure that you use a simple and elegant invoice design. If you are using any accounting software, chances are, professional invoice templates might be inbuilt. Just upload your company logo and you are all set. You should always give estimates or quotations to your clients before the project begins. You should include things like deadlines, delivery items, revisions and other considerations as defined in the policy making step above. Proposals also give your clients an idea about how much he will be paying to you in future. When it comes to invoices, clients do not like surprises. If there is an deviation in the order as mentioned in the proposal, you should inform your client about the change in fees. Lot of vendors tend to postpone this discussion till end of the project. When clients come across these new charges, they will either negotiate with you to waive off those fees or just delay the payment. So, whenever there is any change in the originally accepted terms, specially regarding pricing, inform your clients immediately and make them aware about the change in fees. Hope you got a chance to check the final report that I sent you on Wednesday. Would love to hear your feedback on that. Between, I'm going to send you an invoice tomorrow. Please check and revert in case you have any queries. This simple trick works very well. If the client is not yet ready to pay, he will respond immediately. And if he is fine with the deliverables, you can expect to get paid really quickly. You can use one of the invoice templates provided by MS Word to create a simple invoice. You can customize the look and feel the way you want. Only problem is that, you will have to change things like invoice number, product name and other common details manually every time you create an invoice. Another drawback is you have to track receivables manually which can become painful as the number of invoices grow. For step by step instructions, check how to create an invoice in Word or in Excel. I would strongly recommend to use this approach as you can not only create beautiful invoices using an accounting software, but you can also track meaningful data like payments received, unpaid and overdue invoices, etc. ProfitBooks is a simple accounting software that can help you create professional invoices. I will be using it as an example to explain next steps. You can create a free account here. Also check this guide to choose a right accounting software for your business. Your invoice should have your company logo. Most accounting and invoicing softwares like ProfitBooks provide this option. Your invoice should always have details like your Company name, detailed address, Tax ID, Phone number and Email. If you have already provided these details, ProfitBooks will automatically show it on the invoice. Avoid charging your client for “Design” or “Web Development Fee”. These are high level terms and are not very helpful to the client. It’s better to detail the service as “Brochure Design For XYZ Campaign November 2015”. In case of products, rather than mentioning the broad category, provide detailed specifications. Along with the tax rate, mention if the amounts are tax inclusive or exclusive. In some cases, like VAT in India, you are required to show a notice on every invoice. Always show the due date on invoice. Some businesses use positive reinforcement like ‘discounts on early payment’ or negative reinforcement like ‘late fees’ on the invoice. Select the best strategy relevant to your business and mention the details in your terms. This brings us on the terms & conditions section. Ideally its shown at the bottom. You can include important points from your policy which we discussed at the start of this article. Including precise and clear terms will only help you to avoid disputes later. Most businesses add a section called ‘Notes’ at the bottom of an invoice. You can mention the payment details in this section. For example, mention bank details with account number if you want to get paid via online bank transfer or if you want to get paid by a cheque, mention how your company name should be exactly spelled. Depending on your business requirement, you might have to include additional information like Purchase Order Reference or name of a sales person, etc. ProfitBooks lets you add upto 3 custom fields to capture additional data. You can also get a detailed report on these custom fields. In ProfitBooks, you can set the invoice to repeat in future. So, if you need to bill your client every month or every year for the same service, you can set the frequency at the time of creating an invoice. If you have customers paying you in different currencies than your local currency, you can set that in ProfitBooks as well. Its also possible to convert an existing estimate to an invoice. This will save your time and have a complete track of customer communication. Lot of business owners or freelancers delay sending an invoice even after the product or service is delivered. Please do not commit such mistake. They say, hit when the iron is hot. When billing is delayed, payment is also delayed, and in sometimes can be forgotten. This also gives your customer a chance to negotiate and settle the balance. So, bill your clients immediately, on the same day of delivery. Referring to “invoice #0345” rather than “That invoice I sent you last month, I think on a Wednesday,” is much easier to track for both you and your client. Assign numbers to your invoices systematically, consistently and chronologically. Some people number their invoices by year (for example, 2015012 would be the 12th invoice of 2015). If there are multiple invoices part of a same project, you should specify a code for the project. For example, WEBDESIGN009 would be the 9th invoice for the web design project. Having an invoice and project numbering system keeps everything in line. If you are using Profitbooks, you can group invoices according to the project. 3) Save paper, Email invoices. Nowadays, people prefer digital copies of the documents as its much easier to store and find when required. So, whenever possible, email your invoice rather than taking a print and sending it manually to the client. This will save time and make life easy for both you and your client. Preserve your invoice prints in a file for later reference. Even when emailing an invoice, store a copy of PDF locally. Its also recommend to take periodic backups. Switch to cloud accounting if you want to do this automatically. Customers are not always quick to make the payment and need to be reminded over and over again. This can get tricky as continuous follow up can sometimes annoy your customer. So, how can you do it without sounding pushy? Make it personal – Don’t send automated mails, your client will not bother to open them. Keep it short – Just couple of lines would do. No need to send the entire project story. Remind by asking if they received the invoice. I hope you got a chance to check the invoice I sent you last week. As I didn't hear from you, i was wondering if you have any questions around it. In case you missed it, I'm attaching it with this mail for your reference. Please check and revert. Politely remind about the pending invoice. Hope you are doing fine. I was just going through the list of pending invoices and noticed there is one invoice pending on your name. Its already past the due date, request you to please make the payment. Happy to get into a quick call if you have any questions. Don’t mention about the invoice and try to understand why the payment is delayed. Best way is to discuss it over a phone call. How are you?. Its been a month since I heard from you so thought I would quickly check the things at your end. I tried to reach you couple of times over emails. Can we have a quick call tomorrow morning at 10am? I would like to discuss some pending stuff. Please suggest the alternate time if you are not free around 10am. If everything goes well and you get paid on time, you should always send a short note thanking your customer for the payment. Hope you liked this guide to create professional invoices and bill your clients. If you use any effective technique which you think will be useful to fellow entrepreneurs, please feel free to share it in comments below. PreviousPrevious post:8 Tips & An In-depth Process To Choose A Perfect Accounting SoftwareNextNext post:How to record owner contribution in the business? Pingback: 10 Cashflow Mistakes That Can Kill Your Business! Pingback: What Is Invoice Discounting And How You Can Benefit From It! Hi James. I didn’t really understand your query. Please elaborate. Hi Digbijaya, glad you liked the post. Thanks for sharing the information. what about the costing. Thanks Harshit for this post , i have been searching free tool to create invoice online and i get what i want . Pingback: Krishi Kalyan Cess (KKC) - 15 Questions Answered! Pingback: Swachh Bharat Cess Tax - All You Need To Know!